A moist spiced gingerbread cake topped with orange buttercream! I grew up in a house where there was always a loaf of gingerbread cake in the bread bin. Close beside it would be a lump of butter, kept at room temperature which was great for spreading on the gingerbread. I certainly took my moms baking for granted. Those days are gone now. I don’t have a bread bin and my butter is kept in the fridge which causes me great distress when I need to spread some on my toast (kidding). After growing up with room temperature butter I seem to be doing okay. Does anyone else keep their butter on the counter? Eggs have a similar issue. Most Europeans are able to keep their eggs at room temperature. This is because the eggs haven’t been put through a vicious wash cycle, like they are in the U.S. which scrubs away an important protective part of the shell. What goes with gingerbread cake? Traditionally where I grew up gingerbread cake is eaten with good salty butter. But this orange flavored buttercream icing is also amazing making this cake a great option for Thanksgiving or Christmas when you have to feed a crowd. 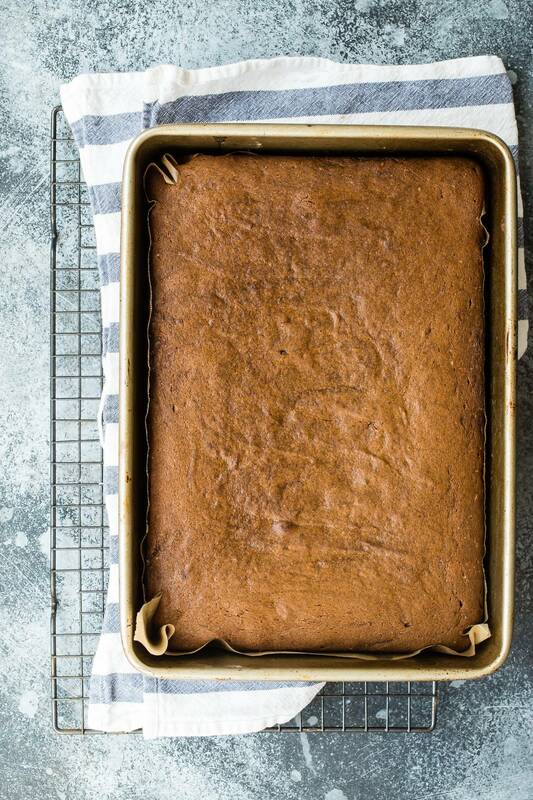 How to store leftover gingerbread cake. Should there be any leftovers, not sure why but it’s best to keep them in a plastic tupperware dish with a sealed lid. The cake can stay fresh for a couple of days in the fridge but don’t forget to let it come to room teperature before serving or the frosting will still be hard. 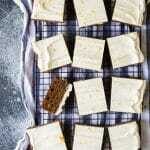 Cut this cake into 12 squares and serve along with some really strong coffee. 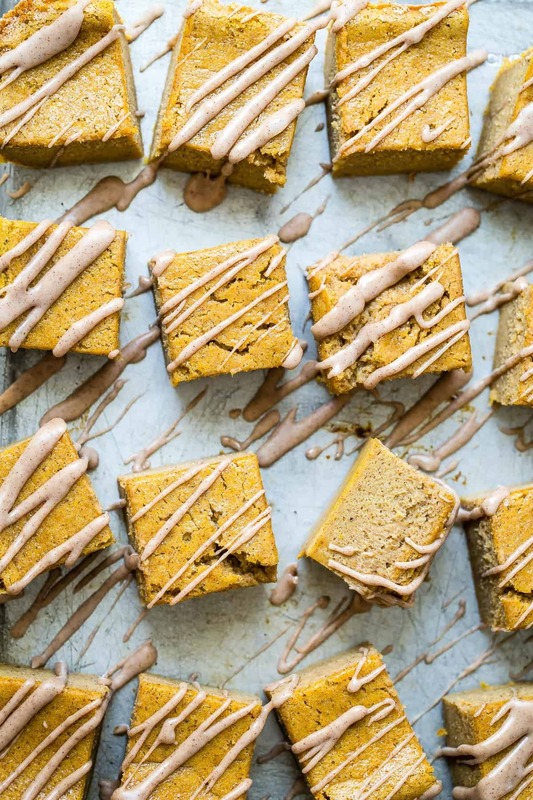 Check out these other sweet treats perfect for the holidays. 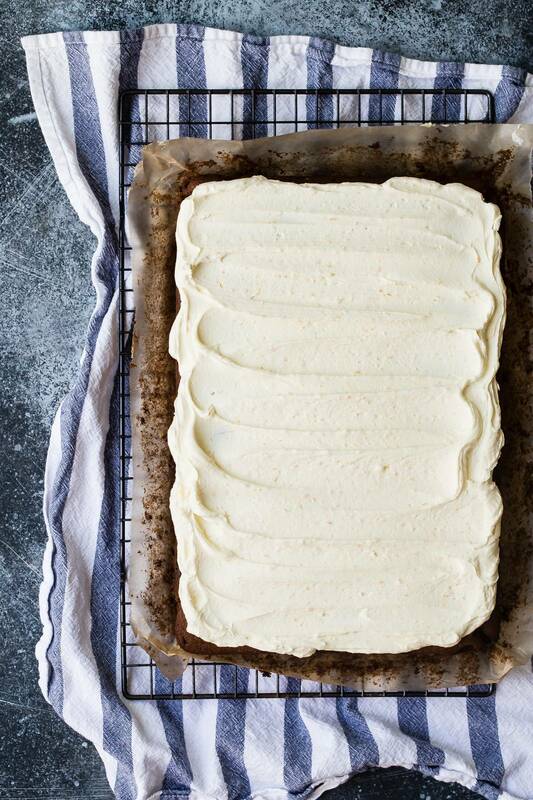 A moist gingerbread cake with orange buttercream frosting. Preheat the oven to 350 degrees F. Grease and line a 13 x 9 baking tray with parchment paper. in a large bowl combine the flour, ginger and cinnamon and set aside. beat the butter and then add the sugar and molasses to it whisking until smooth. Add the dry ingredients gradually to the wet batter scraping down the bowl a few times. Gradually add the milk in small amounts to the rest of the ingredients stirring as you go until the mixture is smooth and lump free. Pour the batter into the prepared pan and spread out evenly. Bake in the oven for 35 minutes or until the center of the cake springs back up when gently pressed. Place the cream butter in the bowl of a stand mixer and beat for 2 minutes. Add the powdered sugar and mix on low speed until it comes together. Turn the mixer to high and beat for another 5 minutes. Add the vanilla, milk and the orange zest and gently mix through. Keep in the refrigerator until ready to use. Let the cake cool before spreading the cream cheese icing evenly over the top of the cake. Slice into even squares and serve. This cake is best served at room temperature. Store in a sealed container in the refrigerator for any longer periods of time. 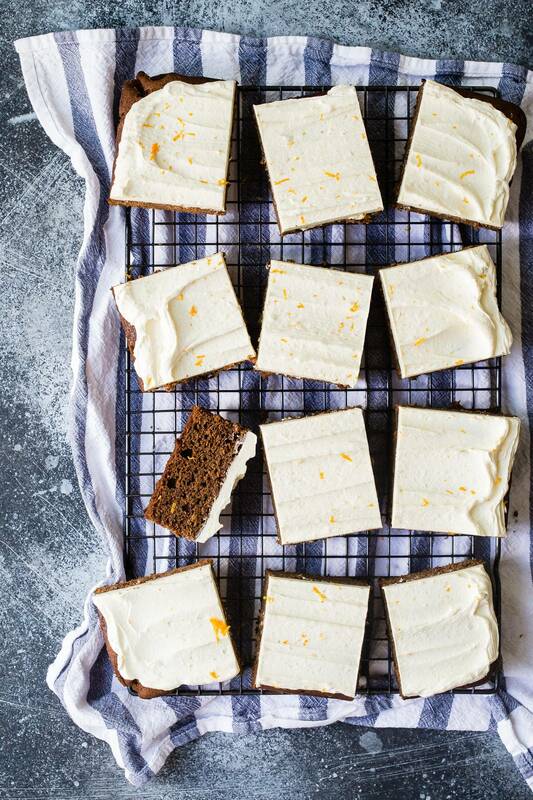 Yes please, love the orange cream cheese frosting! 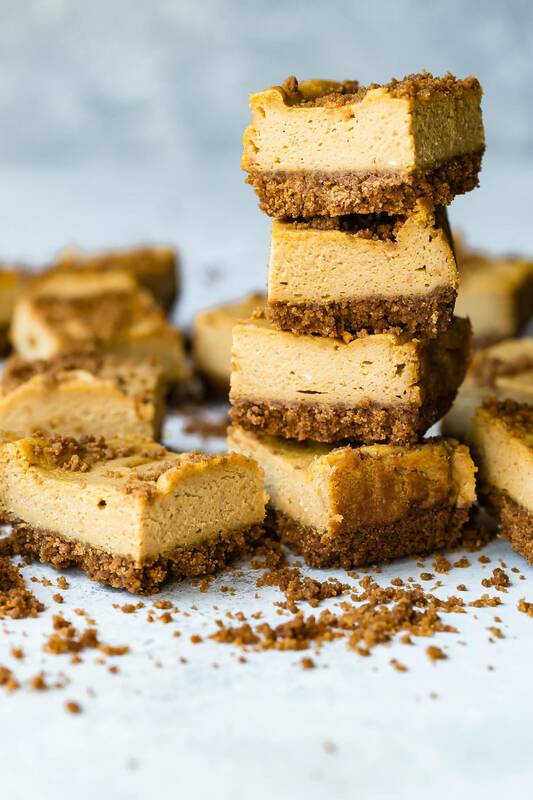 This sounds like the perfect holiday dessert that everyone will love. I have been craving a slice of soft gingerbread! Love it with a dollop of whipped cream but I bet this orange icing is terrific. Eggs in the fridge except them making macarons and I wish we kept our butter at room temp too. It would be so much easier to spread! 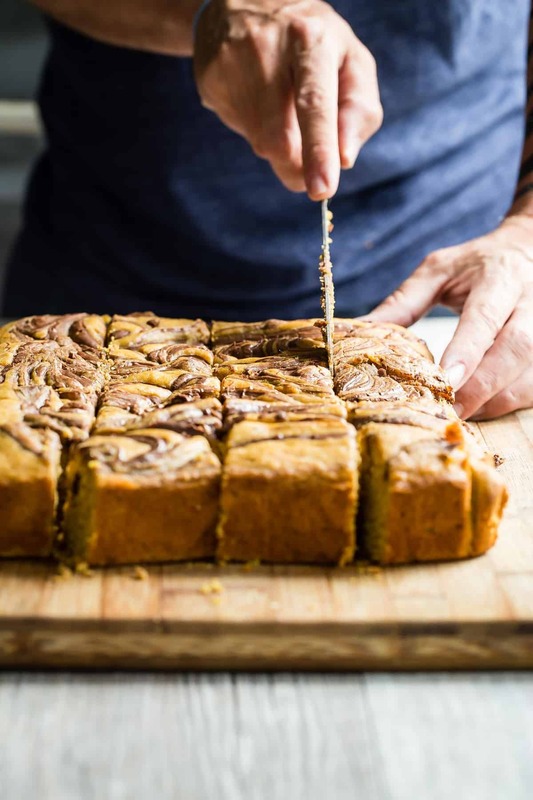 Love this bread and that orange frosting even more! I love gingerbread spiced baked goods. They are even more delicious sitting at room temperature for a couple of days. I think I’d eat the whole thing at once. Thanks Ela, I appreciate it! Oh my goodness, this cake looks heavenly. What perfect flavors for winter! Keep up the delicious posts. This is fantastic! Just pinned. This truly says Christmas to me! This looks heavenly! Will Grandma’s Original Molasses work? Hi Cassie, that would totally work! Just made this cake and totally messed up…added a whole pint of milk. I wasn’t throwing all that goodness away so I turned up oven to 325 and baked for about 55 minutes. Just tasted and it is a fluffy gingerbread cake. Still good and next time I will remember to try the right way. Thanks! Ahh bummer Sharon , but great recovery!! Took to a community get together tonight. Everyone loved. Shhh too funny. mine took about 10 minutes longer and is now sinking in the middle as it cools. i’m hoping it will taste good despite being uneven. I just found the directions. Left out the milk. The cupcakes taste good. They are not dry. I will remake. Adding the milk should suffice my taste for old fashion gingerbread. Thumbs up for the recipe. YES YES, my Dad always kept the butter (covered) out for easy spreading in the AM AND he made his coffee the night before, for efficiency maneuvers in the morning. WHAT my B-day month. ? 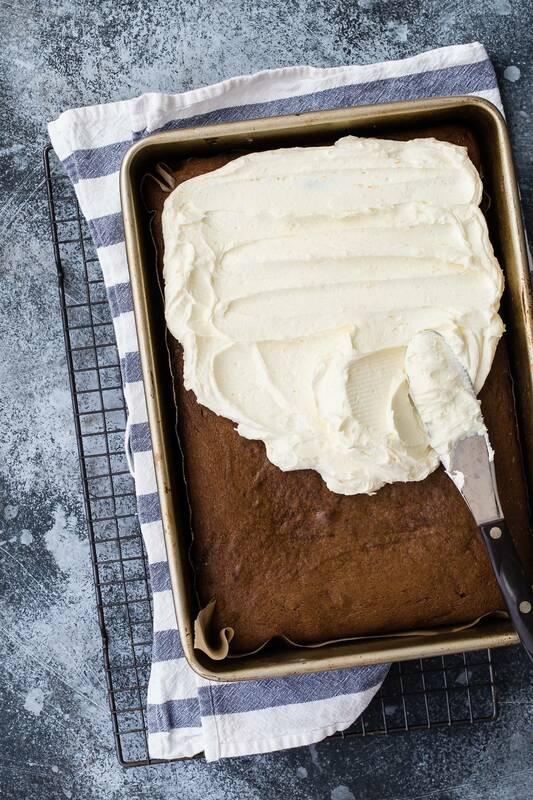 Just when I thought the gingerbread cake alone sounded amazing, you go and top it off with an EPIC frosting! !